Welcome to the first challenge of The Paper Hoarders Push. 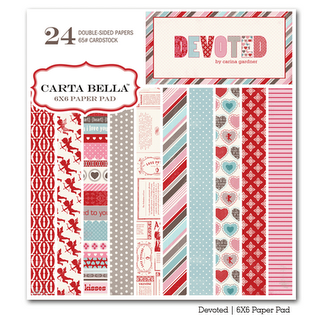 My friend Kim Howard & I have challenged each other in the past to use some of the common paper pads that we have and this time we thought it would be fun to challenge anyone with the Carta Bella Devoted papers to join us. I try to use up the entire pad during these challenges but I fell short this time. I still have several sheets of paper in my pad that I'll have to work into non Valentine cards. :) I do have a few cards to share with you today. I hope you're in the mood for Valentine's. And if you have the Devoted pad from Carta Bella and would like to be included, leave me a comment below and I will link to your blog post. Ok, are you ready for my cards? I found some vintage looking valentine's at a garage sale last summer and worked a couple of them in with this challenge. I thought the Woofers and Tweeters set from Paper Smooches would make a cute Valentine too. I used a Cuttlebug alphabet set for the XO on this card. I also added some May Arts burlap string and pearls/gems. The sentiment circle was created with Paper Smooches stamps and the cute little deer image is from the $1 bin at Michael's. I liked the little deer image so much that I created several cards using it. If you're friends with me on Facebook, you may have already seen this one. I thought the little deer image was so cute I have to share it right away. I went with the chalkboard technique for this card. I stamped the image and heat embossed it, then added some detail with a white pencil and stamped swirls using white pigment ink. And another deer card. I added some paper tickets and a flower gemstone to this one for fun. Finally, I have a little mini card. I used the Paper Smooches Chubby Chums set for this card. I colored the kitty with Copics and added a little heart covered in glitter. Well, that's it for me today. I hope you enjoyed the challenge and don't forget to share a link if you have Carta Bella Devoted creations that you would like us to check out. Now I'm off to see what Kim has done with our challenge. 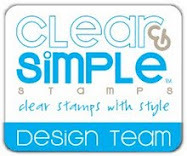 Please stop by her blog and check out her challenge post too. Love your cards Beth, the little deer ones are darling and I love the vintage valentine's your worked onto your cards. Enjoy doing these challenges with you! Oh man, you out-did yourself with all these cards! They are adorable! What a great idea to have a challenge like this. I NEVER seem to use up my paper! An amazing set of Valentine's cards. I couldn't pick a favorite as they are all adorable.